We at S.S.SON CONTROLS ( Mumbai ) are the largest suppliers of Galvanized Flexible Steel Conduits in India . 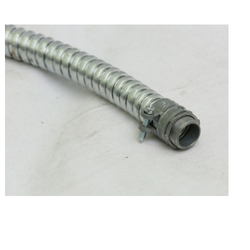 The Galvanized Felxible Steel Conduits available with us have high impact strength , are halogen free , have high abrasion resistance . For more information please send us an enquiry mail . Liquid Tight Flexible Conduit system with smooth Outer PVC allowing conduit to complete sealed from Liquids. Excellent resistance to sudden temperature Variations and has a high crush resistance grading. Size: 3-8", 5-8", ½", ¾", 1, 1¼", 1½", 2", 2½', 3", 4"
Galvanized Steel Flexible Conduit Galvanized Steel Flexible Conduit technical data and specifications as below tables, Any kind of special Galvanized Steel Flexible Conduit can be developed and supplied exactly as per customer specifications and requirement. 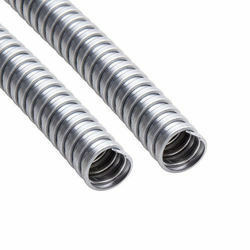 PVC+Galvanized Steel Band AGC -07PJ Galvanized Steel Flexible Conduit, Size: 3/8" - 6"